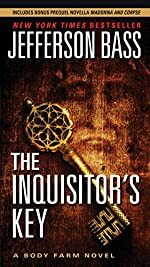 Synopsis (from the publisher): Miranda Lovelady, Dr. Bill Brockton's protÉgÉ, is spending the summer helping excavate a newly discovered chamber beneath the spectacular Palace of the Popes in Avignon, France. There she discovers a stone chest inscribed with a stunning claim: inside lie the bones of none other than Jesus of Nazareth. Faced with a case of unimaginable proportions, Miranda summons Brockton for help proving or refuting the claim. Both scientists are skeptical—after all, fake relics abounded during the Middle Ages—but evidence for authenticity looks strong initially, and soon grows stronger.